Another .NET update later, an hour spent looking this up. Why is mscorsvw.exe using 25% CPU for >30 minutes? The scripts we’ve provided are a convenience for people who don’t want to deal with a command prompt. If you prefer to use the command prompt, you can use the commands below instead. These commands depend on the version of the .NET Framework you have installed and the version of Windows that you have and whether it’s 32-bit or 64-bit. As I said in the previous posts, I’ve reorganized my music library. That included creating sub directories based on the first letter of the artists name (say for example AC/DC would be sorted into the folder A, Iron Maiden would be sorted into I). I have the issue that we use a cloud automation software, which for whatever reason failed to delete the hypervisor snapshots. Now I was looking into a quick way to delete all those 520 snapshots with PowerCLI, and I found something pretty quick. This’ll limit the maximum amount of snapshots to delete at times to 5 (or 10 if you change the $maxtasks value). Well, I’m currently migrating between different cluster layouts, and I had to create the new PortGroups on the old hosts, in order for me to switch between old and new hosts. Well, I use ViMbAdmin for the mail box administration of my users (and aliases) on heimdaheim.de. After I while (well, over half a year I guess), I decided to look at it again. However it didn’t work. Well this was a multi-part problem. After I fixed all that, ViMbAdmin was working again. However I decided to replace my mod_rewrite stuff (I had in my apache config from the previous version) with the one from the Documentation and that actually made things worse. So I ended up *redigging* into mod_rewrite (again *sigh*) and rewrite the Rewrite Rules… This time I’m documenting it. Keep in mind, this is part of my apache config, not a .htaccess file. Well, as I said earlier I’ve been playing around with my Sonos (and in that regard cleaning up my music library). Now, I started setting up my foobar2000 to ignore articles (The, A) when moving/copying file to my music library. 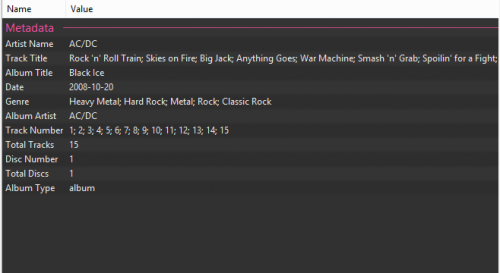 As with everything in foobar2000, that is configurable and uses the Title Formatting. After a short peek into the Foobar2000 forum, I found what I was looking for. I’ve been cleaning up my music library the past few days (well, I bought a Sonos :D), so here’s how you display for example the tagging field MUSICBRAINZ ALBUM TYPE in foobar2000’s default metadata view. I wanted to do it the proper way, so I ended up asking old uncle Google, and it supplied me with the answers I was looking for. Well, considering the time I spent on looking for this and the time I would have needed to change even the seven members – even this is a time saver.